The Duck and Eggs Set is cut out in our workshop. The three ducks are all hand painted white. The first duck is carrying an Easter egg, the second duck hatched out of the easter egg, and the third one is sitting on top of the Easter egg. The dimensions for the Duck Carrying Egg are approximately 20 inches tall by 13 inches wide by 2 inches deep. The sign has a 15 inch stake. The dimensions for the Duck Hatched Out are approximately 17 inches tall by 21 inches wide by 2 inches deep. The sign has a 14 inch stake. The dimensions for the Duck Sitting On Egg are approximately 23 inches tall by 12 inches wide by 2 inches deep. The sign has a 21 inch stake. The signs have a combined weight of approximately 12 pounds with packaging. For the continental U.S. shipping and handling is included in the listed price. For shipping outside the continental U.S. please contact us through our Contact Us page. 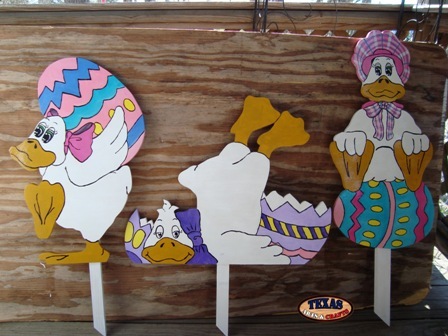 The Duck Carrying Egg is cut out in our workshop. The duck is hand painted white. The duck is carrying a pink and blue egg. 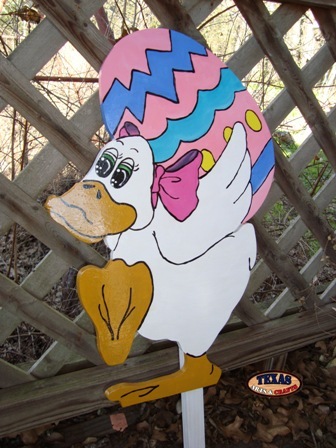 The dimensions for the Duck Carrying Egg are approximately 20 inches tall by 13 inches wide by 2 inches deep. The sign has a 15 inch stake. The sign weighs approximately 7 pounds with packaging. For the continental U.S. shipping and handling is included in the listed price. For shipping outside the continental U.S. please contact us through our Contact Us page. The Duck Hatched Out is cut out in our workshop. The duck is hand painted white. The duck just hatched out of a purple and yellow egg. The dimensions for the Duck Hatched Out are approximately 17 inches tall by 21 inches wide by 2 inches deep. The sign has a 14 inch stake. The sign weighs approximately 7 pounds with packaging. For the continental U.S. shipping and handling is included in the listed price. For shipping outside the continental U.S. please contact us through our Contact Us page. 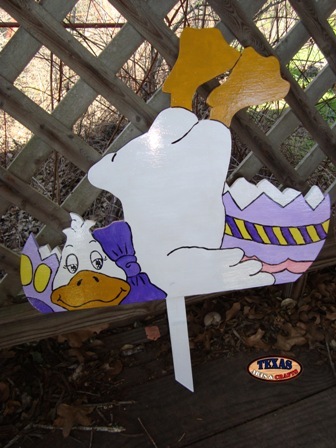 The Duck Sitting On Egg sign is cut out in our workshop. The duck is hand painted white. 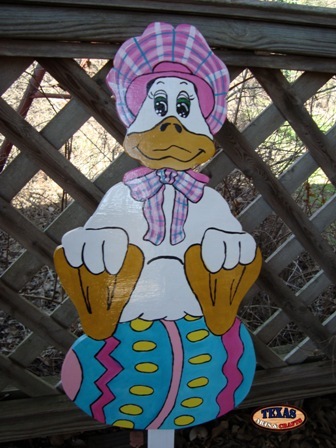 The duck is sitting on a blue, pink, and yellow egg. The dimensions for the Duck Sitting On Egg are approximately 23 inches tall by 12 inches wide by 2 inches deep. The sign has a 21 inch stake. The sign weighs approximately 7 pounds with packaging. For the continental U.S. shipping and handling is included in the listed price. For shipping outside the continental U.S. please contact us through our Contact Us page.